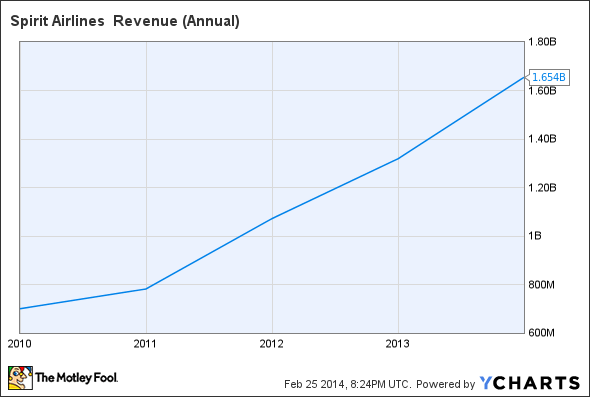 Is Spirit Airlines a Long-Run Winner? Looking at what Spirit is doing now, and what they're shooting for in the future. We've been hearing a lot about Spirit Airlines (NYSE:SAVE) in the news lately – about how they are the fastest growing airline, how their customers hate the Spirit flying experience (yet still insist on filling up flights), and even about their crass advertisements. This is a good opportunity to dig in to the business and find out what impact, if any, Spirit should have on your portfolio. Well, what does "well" mean? To me, a company does well if it facilitates sustainable growth in its customer base, offers a product or service that its customers want, has a realistic growth strategy, and has management commitment. Based on these criteria, I think Spirit is going to do well. As you can see, they are already increasing their revenue at an impressive rate. But the biggest reason for my optimism for the company is that they are the first major airline to implement a low-cost leadership business strategy. That is a pretty strange thing to realize. All of the big players – Southwest, Delta, American, United, Jet Blue – are competing on differentiation or operational effectiveness. Everything Spirit does revolves around minimizing costs, so that it can minimize airfare for customers. Spirit puts more seats on each plane, doesn't offer free beverages, and even keeps its administration costs down by operating out of an unadorned headquarters in Florida. The result is simple: very low airfares. Compare this to Southwest Airlines (NYSE:LUV), a longtime investor favorite. Southwest competes on an operational effectiveness strategy. Southwest operates as a well-oiled machine: their turnover time is low, their choose-your-own-seat system is quick and effective, and they have some of the friendliest and happiest employees in the industry. Everything is meant to go smoothly on a Southwest flight, and its customers are very happy to return for the experience. Although there will be some competition on the margin between Spirit and Southwest for those customers that can pay a little bit more for flights and would like a nicer flying experience, Spirit is likely to draw a penny-pinching flyer who, had Spirit not offered ist rock-bottom airfare, would likely not fly at all. There is a very large portion of the population that does not fly, due to prohibitive costs, and Spirit is primed to tap that market. This implies realistic and sustainable growth in its customer base – which can translate into high earnings for investors. Because of the high barrier to entry in the airline industry, and the entrenchment of existing competitors in their own strategies, it is possible that Spirit will remain the only truly low-cost leader in airlines for a long time. In addition to their competitive position, I like the commitment I've seen from their management. In particular, their CEO, Ben Baldanza, seems even to enjoy trying to stretch every dollar as far as possible, so that he may reduce Spirit's airfare further. A recent interview with NPR's Planet Money gives insight into the way he views Spirit's strategy. To research the extent to which Spirit prices undercut those of Southwest flights, I searched for a round-trip from San Antonio to Boston in May. The result: $250 for Spirit and about $425 for Southwest. This is an impressive price cut, but nonetheless an incomplete comparison – and it brings about two concerns. First, Spirit still has a limited number of routes. It doesn't fly to San Antonio, so I'd have to drive to Houston or Dallas to make the trip up to Beantown, adding to travel costs and time. It appears that Spirit is actively adding to the number of routes in its portfolio, which is good. But until the number grows substantially, I think that the growth in its base will be somewhat capped. Second, only a certain type of flyer is suited to save money on a Spirit flight. If you can't handle the lack of elbow (or knee) room and don't like potential free-for-alls trying to find your own seat, then Spirit may not be for you. Additionally, passengers with substantial amounts of luggage can kiss their savings goodbye, as Spirit's fees are plentiful and add up quickly. If it turns out that there aren't enough flyers willing to fly without extra bags, or can't deal with the cramped spaces, Spirit may not do as well as some hope. Lastly, they have an unconventional approach to advertisement. They offer very basic, yet sometimes crass, advertisements for their flights. With bikini-clad models in high heels and suggestive imagery in their ads, I struggle not to question their executives' most basic decision-making skills. While shock advertising is not a new phenomenon, Spirit's blatant objectification of women in their ads breeds uncertainty about their professionalism as well as their ability to appeal to a wide customer base. As with all companies, this one deserves more looking into. Do you own research on Spirit, and decide what you think they are (and are not), and what you think they will become. The airline industry is a volatile force – one with sky-high revenues and make or break investment opportunities. In addition to deciding whether you like the outlook of a particular airline for investment, ask yourself where an airline stock fits in your overall portfolio, making sure, as always, that you're as diversified as you should be. Hi, I'm Brian. The only thing that I love more than cooking and running is investing. I think that with the right combination of intuition and due diligence, we can all make a lot of money by holding stocks.